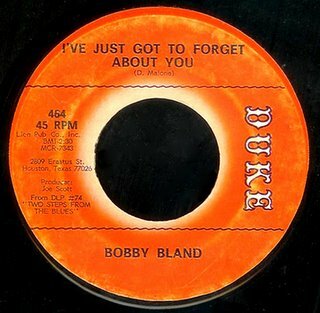 Somehow, even though we all knew it was coming, it doesn't seem possible that Bobby Bland is no longer with us. He was there in Memphis at Sunbeam Mitchell's Club Handy when it all began, and he lived there in Memphis until the day he died, same as he ever was. An absolute giant of R&B, his was one of the last great voices at the heart of Black American Music. His name was a mainstay on the R&B charts for four decades, and he never stopped performing, working wherever and whenever he got the chance. The music he created was deep, in every sense of the word. This awesome record we have here, the flip of 1961 monster hit Turn On Your Love Light, just knocks me out. 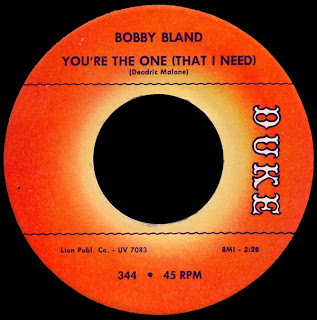 Bobby's smoke-filled velvet vocals fill the room while Wayne Bennett's impeccable guitar work and Joe Scott's mournful arrangement bring it on home. A contemporary of Sam Cooke and Ray Charles, he contributed as much (if not more) to the evolution of Soul music as either one of them. So much more than a 'Blues' singer, I don't think mainstream America ever truly appreciated how great he really was. This past January 22nd would have been Sam Cooke's 75th birthday. 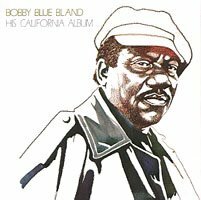 January 27th was Bobby Bland's 76th. Bobby was born in the small town of Rosemark, Tennessee, where he grew up surrounded by the sounds of spiritual music as well as The Grand Ol' Opry broadcasts on WLAC. He actually picked cotton in the fields, and didn't bother going to school much. When the family moved to Memphis in 1947, he joined a local Gospel group called The Miniatures that sang in area churches. It wasn't long, however, before the young Bland was drawn in by the whole blues scene that was happening down on Beale Street. In addition to working in a local garage, he began parking cars down behind the Palace Theatre, and soon became a regular fixture. He would compete in the amateur shows staged by Rufus Thomas most every Wednesday, and came to be known as one of the Beale Streeters, a loose collection of local guys that would include B.B. 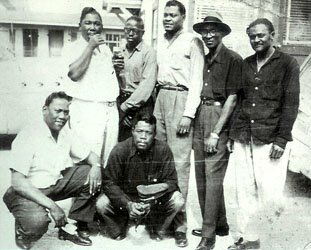 King, Johnny Ace, Junior Parker, Roscoe Gordon, and Earl Forest at one time or another. They took work where they could get it, often performing at local brothels or upstairs at Sunbeam Mitchell's legendary Club Handy for little more than a bowl of chili. It was Mitchell that got Bobby a spot on Rufus Thomas' radio show on WDIA. This got him noticed by Sam Phillips, who had just started recording local acts at his Memphis Recording Service. 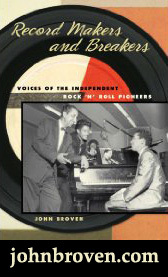 He did a session on Bobby for Chess Records in 1951, and early the next year, Ike Turner produced four sides for Modern Records at the studio, none of which made much of a splash. 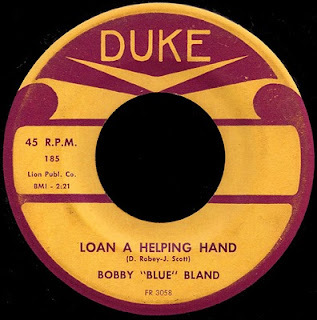 Later in 1952, Bobby signed with Duke Records, a new label that had been started up by WDIA DJ Dave Mattis. They would release one single, Lovin' Blues, before Bobby was drafted into the Army. 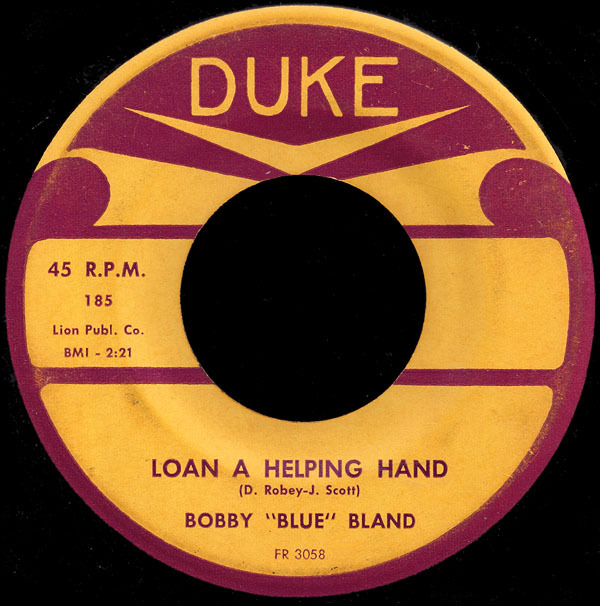 The record became somewhat of a regional hit while he was away, and Duke recorded his Army Blues in 1953 while he was home on leave. Don Robey, meanwhile, was busy building his own little empire. 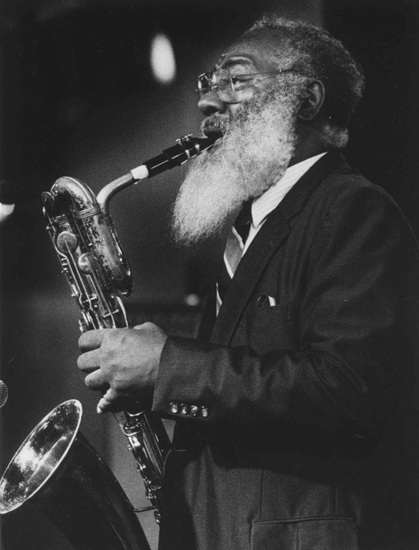 He had opened a club called The Bronze Peacock in Houston, Texas in 1945 that became the premier showcase for Jazz and R&B in the region. 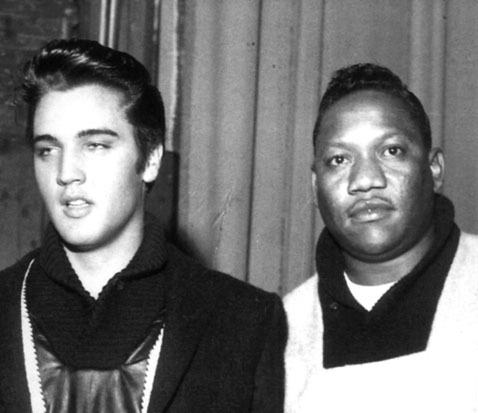 He began managing local artists like Clarence "Gatemouth" Brown, and would open a record store in 1947. 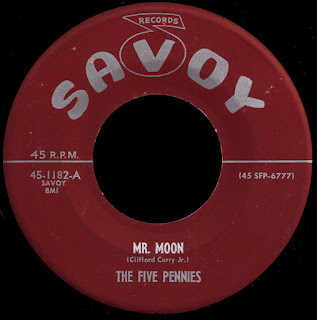 It wasn't long before he realized there was real money to be made in the record business, and in 1949 he formed Peacock Records, building his own recording studio and record pressing plant adjacent to the club. 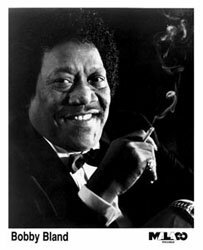 He began building an impressive roster of Gospel and Blues talent, and his records became huge sellers in the Southern market. Robey had the reputation of running his business "like a plantation", often making his point with a pistol he kept strapped to his leg. In addition to recording and pressing his own records, he would pay writers a few dollars up front, then claim songwriting credit and publishing rights for himself. 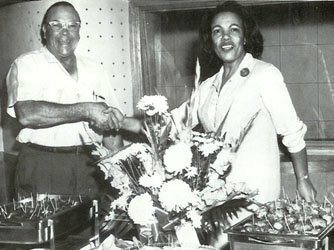 He also made sure his artists were represented by his own Buffalo Booking Agency, run by partner Evelyn Johnson (pictured here with Robey). He had all the angles covered. Ever on the lookout for a new source of income, Don had his eye on Memphis. 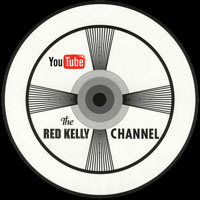 He made a deal with Dave Mattis, giving Duke a much needed infusion of cash, and by late 1953 Robey had forced him out, becoming sole proprietor of Duke-Peacock Records. When Bobby was discharged from the service in 1955, the Memphis he knew was no more. Sam Phillip's own Sun Records had found its fair haired boy, and his contract with Duke was now owned by someone he'd never met somewhere in Texas. 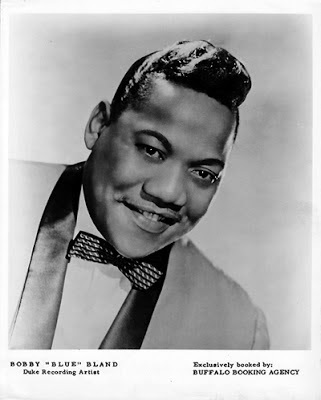 He and Robey actually got along well together (he often said it was better than pushing a plow...), and he rejoined old friend Junior Parker as part of a package called Blues Consolidated that Buffalo Booking had put together. Playing more than 300 gigs a year, they criss-crossed the country, just smokin' it up! Duke would record them whenever they came through Houston, and so kept a steady stream of "product" out there for sale. Most of these early sides featured the great Clarence Hollimon on guitar, but it was his old Memphis homeboy Pat Hare (who would later go on to become a member of Muddy Waters' band before being sentenced to 99 years in prison for killing his girlfriend and the cop she called on him...!) that drove his first national hit Farther Up The Road all the way to number one on the R&B charts in 1957. The success of this record (as well as his subsequent top ten hit, Little Boy Blue) enabled Bobby to set out on his own, forming the incredible band that would stay with him for the next ten years. It would include Wayne Bennett on the guitar, Teddy Reynolds on the piano, Hamp Simmons on bass, Jabo Starks (future funky drummer for The JBs) on the drums, along with a fat horn section led by trumpeter Joe Scott. It was Scott's arrangements that brought Bobby's music to the next level, essentially creating his unique sound. He continued to top the R&B charts, while staying out on the road 50 weeks of every year. 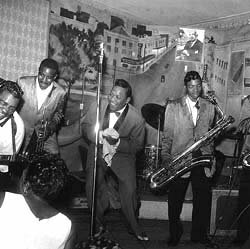 The band was playing all the popular package shows of the day alongside people like Sam Cooke and Jackie Wilson. Bobby understood, as they did, the power of the female audience, and each night was like a contest to just "take 'em out"! 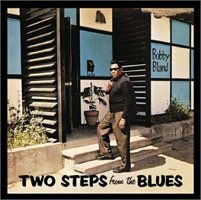 Bobby continued to top the R&B charts with records like Turn On Your Lovelight and Yield Not To Temptation, and in 1962 would score his only top 40 pop hit (#28) with T-Bone Walker's Stormy Monday Blues, powered by Wayne Bennett's phenomenal guitar work. 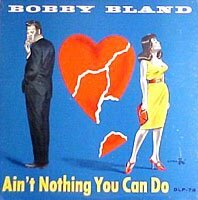 1964's Ain't Nothing You Can Do was an absolute monster hit that literally defined the southern "soul-blues" style of which he was the king. It is this very designation (thought up by us genre-driven white people) that, in my opinion, has tended to marginalize people like Bobby, Little Milton, and Z.Z. Hill. I mean, he's like "too soul" to be taken seriously by the blues "purists", while being often overlooked by the soul crowd as having too much "blues"... or something. Whatever. His own people know the deal. He has entered the R&B charts an incredible 63 times, placing no less than 25 records in the top ten. 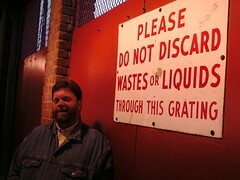 By the end of the 1960s, Bobby's drinking (over two quarts a day) caught up with him, and his band split up. The loss of Joe Scott as his arranger took its toll, and his early seventies output was inconsistent. 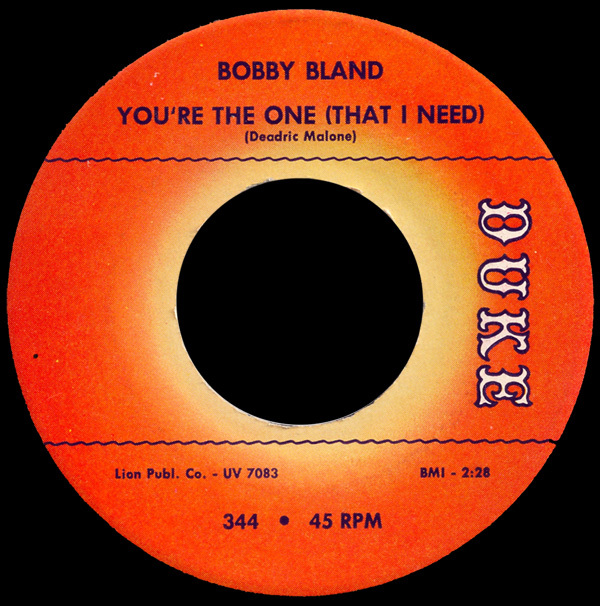 In 1973, Robey sold Duke to ABC Records, which was later taken over by MCA. 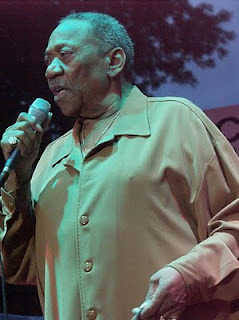 He would re-unite with former Beale Streeter B.B. King for a few mid-70s outings but, for the most part, a combination of record company indifference and changing times led to some truly middle-of-the-road material. Bobby signed with good ol' Malaco Records in 1984 and got back to his southern soul roots. The release of Members Only the following year put him right back in the R&B top 20 where he belonged. He would go on to release over 15 albums for them over the next twenty years, highlighted by great songs like Take Off Your Shoes and I Just Tripped On A Piece Of Your Broken Heart. I saw him again about two weeks ago, opening for Dr. John at a theatre in New Jersey. 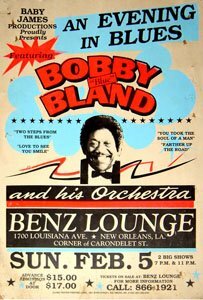 About half the crowd was made up of well-dressed African-Americans in their sixties and seventies... Bobby's audience that has grown old along with him. People that remember Sam Cooke... that were a part of the struggle for civil rights. A generation that is passing before our very eyes. Bobby's amazing voice, still a powerful instrument, spoke to the soul of everyone in the room. He had us in the palm of his hand. Talk about a living legend, man. In 1984 Dan Greer and Fred Ford got together and formed an organization named 'Friends United To Preserve Musical Heritage International'. The idea, Dan told me, was to relate the rich history of Memphis music in the words of the people who made it in the first place. 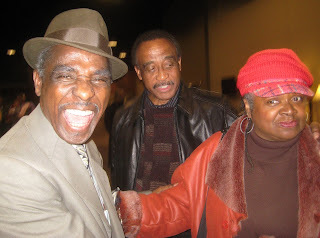 They created an event called the Music Pioneer Awards and Ford, the go-to baritone man in Memphis for generations, became their first honoree (once Dan convinced him it was alright). Fred has since left us, but the organization (now called simply United Music Heritage, Inc.) continues on with a board that includes folks like Percy Wiggins and Earl Randle. 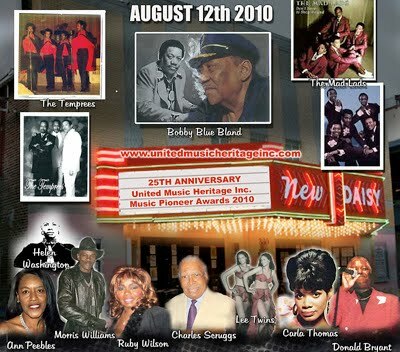 I met Dan Greer at the Willie Mitchell Memorial Celebration in January, which is where he started thinking about putting together the incredible Twenty Fifth Anniversary Music Pioneer Awards that will be held at The New Daisy Theater on Beale Street this Thursday, August 12th. "Too many of us are passing," he said, "it's time to do something." The event will honor Carla Thomas, Don Bryant, Ann Peebles, The Mad Lads, The Temprees, Ruby Wilson and The Lee Twins among many others all backed by the incomparable Hi Rhythm, along with a horn section led by Ben Cauley. 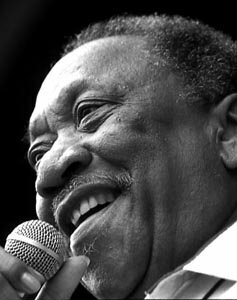 As if that weren't enough, the centerpiece of this year's awards will be a tribute to one of the cornerstones of Memphis music, Bobby "Blue" Bland. Bobby, who turned eighty this past January, was one of the original Beale-Streeters, and his absolute giant of a voice has influenced all those who came after him. The show will feature killer vocalists like J. Blackfoot and Percy Wiggins performing his music... can you imagine? As Greer told the Commercial Appeal; "You won't find another show like this, you couldn't pay these people enough to come in and do this. But they come in and do it out of love for the city and the music." This is one of those many, many times I wish I lived in Memphis.